The stories, events, and teachings contained in the scriptures of the Old and New Testaments of the Bible, from Genesis to Revelations explained with accessible text and bold graphics. 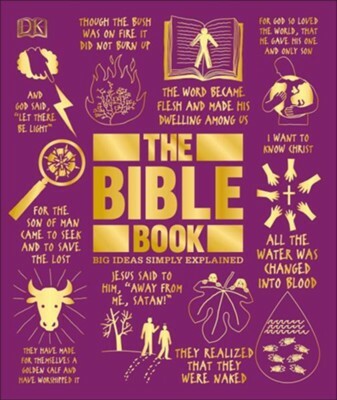 The Bible Book explores the ideas and beliefs key to the teachings of the most widely printed religious book of all time. This highly visual book highlights more than 100 of the most important Biblical passages and explains their theological significance and key concepts. Profiles of primary figures--from Adam and Eve, to Peter and Paul--and places of the Bible, such as Jerusalem and Rome, add context to the scriptures. Essential theological concepts, such as the Trinity, God's omnipresence, and the salvation of Jesus death, are explained in detail. Infographics illuminate the most significant concepts clearly and simply. The Bible Book is perfect for anyone with an interest in religion and the foundational text of Christianity and Judaism. DK was founded in London in 1974 and is now the world's leading illustrated reference publisher and part of Penguin Random House, formed on July 1, 2013. DK publishes highly visual, photographic nonfiction for adults and children. DK produces content for consumers in over 87 countries and in 62 languages, with offices in Delhi, London, Melbourne, Munich, New York, and Toronto. DK's aim is to inform, enrich, and entertain readers of all ages, and everything DK publishes, whether print or digital, embodies the unique DK design approach. DK brings unrivalled clarity to a wide range of topics with a unique combination of words and pictures, put together to spectacular effect. We have a reputation for innovation in design for both print and digital products. Our adult range spans travel, including the award-winning DK Eyewitness Travel Guides, history, science, nature, sport, gardening, cookery, and parenting. DKs extensive childrens list showcases a fantastic store of information for children, toddlers, and babies. DK covers everything from animals and the human body, to homework help and craft activities, together with an impressive list of licensing titles, including the bestselling LEGO® books. DK acts as the parent company for Alpha Books, publisher of the Idiot's Guides series and Prima Games, video gaming publishers, as well as the award-winning travel publisher, Rough Guides. I'm the author/artist and I want to review The Bible Book: Big Ideas Simply Explained.